Three has launched a new plan aimed at those who watch most of their TV online, offering data plans which give ‘free’ internet to watch services like Netflix. Using these services will be ‘zero-rated’, which means customers will be able to stream as much as they want through certain services without the data used affecting their monthly allowance of gigabytes. It’s not just Netflix on offer, with TV Player giving access to over 100 channels (including the main terrestrial channels and those wider, such as Dave), and SoundCloud and Deezer also being given the 'zero-rated' treatment. While Vodafone offers free access to online services from Sky as part of its price plans, the data used will still be taken from your data allowance - the key difference with Three is that users will be able to use the rest of their data as normal outside of the services listed. However, this isn’t going to be free for current users. 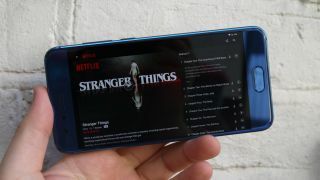 Eligible customers (those with 4GB of data allowance per month or more, or those on the Advanced plan, able to take the offer) will have to pay extra per month to get access to the Go Binge plans. New eligible customers will be automatically enrolled in the Go Binge service, although there will be an option to opt-out - it’s currently unclear if doing this will save money though. The service is launching today and will be offered to all those who use Three’s network, including contracts, SIM-only deals and broadband subscriptions. We’re currently finding out whether you can use the Go Binge service on devices other than a tablet or phone. You’ll also need a subscription to these services already, with Three assuming that so many people will have already signed up and will use the new plan to augment, rather than experience, their online streaming.